The farm is a host to many creatures. 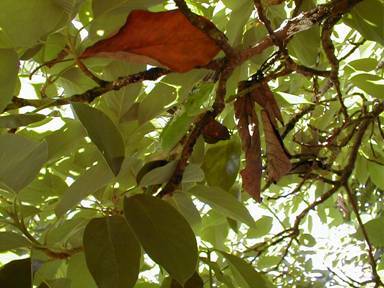 Look carefully—there is a Jackson’s Chameleon (Chamaeloeo jacksonii xantholophus) on the avocado branch. Not native to Hawaii, but rather introduced in 1972 (escaped pets), they are well established on most of the Hawaiian islands-in fact, most Jackson’s Chameleons sold on the mainland as pets are from wild caught in Hawaii. We see a fair amount of them in the coffee lands.